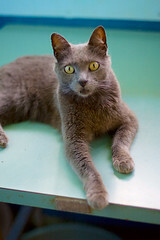 Feline kidney disease is a common problem for older cats. However, it can affect cats of any age. There are many different reasons why your cat could develop this disease. Let’s take a look at some of the most common causes. Toxins are one of the leading causes of feline kidney disease. Cats will readily lick antifreeze if they come across it on the ground. It will quickly destroy your cat’s kidneys if treatment isn’t sought immediately. Other toxins that can cause this disease include solvents, pesticides, and heavy metals. Also, medications that your cat may be taking can cause problems with the kidneys. Medications for humans such as aspirin and antibiotics are also common culprits.